Bellatrix, I'm a Pug! : Pug + pool = Towel! Yep...that's me...The Belly...under a towel. Seems that Daddy let me out in the backyard to do some pee-pee-pody. Well, being silly Daddy, he turned his back, and I jumped into my Pug-Pool! It was sooper hot, today, so I needed the cool-off. It's a mini-pool for hooman kiddies, so the water wasn't that deep, but deep enough that I left pugpaw prints all over the house! That's when Daddy got the towel, and one of my favorite games began: The Towel Game! Daddy said I shouldn't be rewarded for my pool play, but what's a pug to do? I blame it on belly instinct to be the pug-loony-crazy-funny-pug that I am! Ha ha Belly! I love that you took it into your own paws to go ahead and cool down in the pool. I too, enjoy the towel game, but I must give props to Brigitte for being the best in the house at it. I jump in pools too. It's good that you made sure it wasn't too deep first. Looks like a fun game you're having there! You like to go into the pool ON PURPOSE? we LOVE that you jumped in your pool! 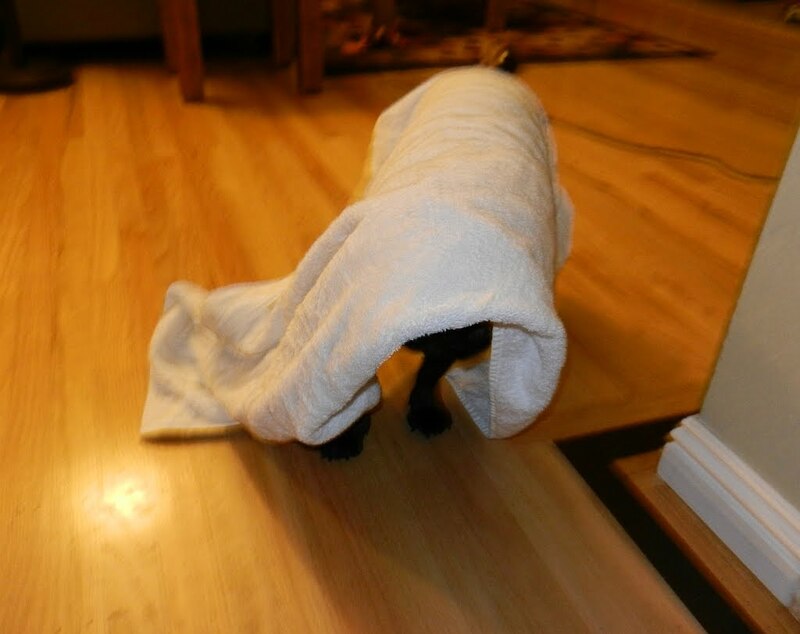 I love playing with towels, but I don't like jumping in pools. Bellatrix, I would (and HAVE) do the same thing on a hot day. Sometimes, I confess, I forget to do my bidness because I am so happy to be in the pool. Towels? I don' need no stinkin' towels! You are so funny! I've never been in a pool before, so I may have to convince my mom to get me one of those kid pools and try it out. I hope you won the towel game! I highly recommend you orb your 'rents into getting you a kiddie pool. Mom got hers very cheap and it's worth it. I love my pool, it's lots of fun and a great way to stay cool! Now Belly I jump into the bath tub all this time but I don't like to get into pools unless there are floating hotdog slices in it....mmmmm. What were we talking about? Oh yes you are too cute in your towel!! Oh! I experienced the joys of floating hotdog slices this weekend. I think I need my very own kiddie pool - chalked full of sliced hotdogs.